Plutarch was born probably between A.D. 45 and A.D. 50, at the little town of Chaeronea in Boeotia. His family appears to have been long established in this place, the scene of the final destruction of the liberties of Greece, when Philip defeated the Athenians and Boeotian forces there in 338 B.C. It was here also that Sulla defeated Mithridates, and in the great civil wars of Rome we again hear, this time from Plutarch himself, of the sufferings of the citizens of Chaeronea. Nikarchus, Plutarch's great-grandfather, was, with all the other citizens, without any exception, ordered by a lieutenant of Marcus Antonius to transport a quantity of corn from Chaeronea to the coast opposite the island of Antikyra. They were compelled to carry the corn on their shoulders, like slaves, and were threatened with the lash if they were remiss. After they had performed one journey, and were preparing their burdens for a second, the welcome news arrived that Marcus Antonius had lost the battle of Actium, whereupon both the officers and soldiers of his party stationed in Chaeronea at once fled for their own safety, and the provisions thus collected were divided among the inhabitants of the city. 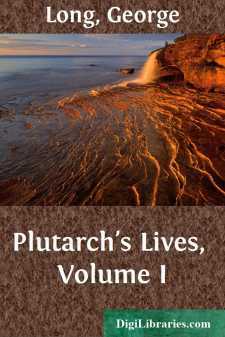 When Plutarch was born, however, no such warlike scenes as these were to be expected. Nothing more than the traditions of war remained on the shores of the Mediterranean. Occasionally some faint echo of strife would make itself heard from the wild tribes on the Danube, or in the far Syrian deserts, but over nearly all the world known to the ancients was established the Pax Romana. Battles were indeed fought, and troops were marched upon Rome, but this was merely to decide who was to be the nominal head of the vast system of the Empire, and what had once been independent cities, countries, and nations submitted unhesitatingly to whoever represented that irresistible power. It might be imagined that a political system which destroyed all national individuality, and rendered patriotism in its highest sense scarcely possible, would have reacted unfavourably on the literary character of the age. Yet nothing of the kind can be urged against the times which produced Epictetus, Dio Chrysostom and Arrian; while at Rome, Pliny the Younger, Tacitus, Martial, and Juvenal were reviving the memories of the Augustan age. From several passages in Plutarch's writings we gather that he studied under a master named Ammonius, at Athens. For instance, at the end of his Life of Themistokles, he mentions a descendant of that great man who was his fellow-student at the house of Ammonius the philosopher. Again, he tells us that once Ammonius, observing at his afternoon lecture that some of his class had indulged too freely in the pleasures of the table, ordered his own son to be flogged, "because," he said, "the young gentleman cannot eat his dinner without pickles," casting his eye at the same time upon the other offenders so as to make them sensible that the reproof applied to them also.